As you enter the five-star Shangri-La Hotel Paris, your senses are immediately aroused. A signature white tea scent called “Essence of Shangri-La” fills the air, a subtle blend of fragrances laced with ginger and bergamot. Your eyes are drawn to the two impressive reception rooms on both sides of the elegant foyer. A bit further back are two alcoves that comprise the lobby. You feel as if you have arrived at a stately home rather than a hotel. Built in 1896 with an elaborate Louis XIV-style stone façade, this historic property once was home to the aristocratic family of Prince Roland Bonaparte, a grandnephew of Emperor Napoleon. The Hong Kong-based Shangri-La Hotels and Resorts Group purchased the building and spent four years meticulously refurbishing it, bringing in craftsmen and artisans to restore the magnificence of the ironwork and marble, as well as the hand-gilded wall paneling and wood parquet floors. With 101 rooms and suites, it opened as a boutique hotel, the first Shangri-La property in Europe, in December 2010. The brand name derives from the 1933 James Hilton novel Lost Horizon that portrays Shangri-La as an earthly paradise. The experience here in Paris doesn’t disappoint. Located in the upscale 16th arrondissement of the city, the hotel sits in a quiet residential area close to several embassies and museums that are steps away from the Seine. We stayed in Room 506, a high-ceilinged, superior room with a king bed that was more than adequate in size by European hotel standards. (Coincidentally, the average room in the hotel measures 506 square feet). Like the rest of the hotel interior, the classic room décor was designed by Pierre Yves Rochon. The walls and upholstery were bathed in soothing shades of blue, white and ecru, blending Parisian and Asian elements, and had a desk area, seating area, and large walk-in closet with plenty of drawer and storage space. The extremely comfortable bed, fine linens, and blackout curtains made it easy to sleep and adjust to jet lag. A master control switch allowed us to control the lighting from each of our bedsides. In brief…simply divine. The oversized marble bathroom with custom wood furnishings and a heated floor had double sinks, and a full-sized bath, separate shower with rainshower head, flat-screen TV embedded in the mirror, and an enclosed toilet for privacy, with a notepad beside the commode (probably intended for inspired writers). In addition to the Bulgari White Tea toiletries, the bathroom was stocked with anything else you might have forgotten or would need including toothbrushes and combs. We’ve been to hotel rooms around the world but never have we been in one that anticipated every need as did this one. The desk came fully stocked with computer cables, electrical adapters, and office supplies from staplers to scotch tape and paper clips. The bathroom had a scale (just in case a naive visitor to Paris wanted to check on weight gain) and retro-style analog clock to remind you that you really need to leave the sumptuous bathroom in time for your next meal. There was a huge eye-level safe, umbrella, and shoe cleaning supplies in the closet, and a Nespresso machine on a credenza to brew fresh coffee or a variety of teas. Wi-Fi was complimentary throughout the hotel and Evian water was left for guests twice daily without any additional charge. A fruit basket was also replenished each day. Do not go directly to your room on the elevators. The public areas of the hotel are stunningly attractive and deserve a visual inspection. The lobby alone has five different types of marble with a vaulted rotunda ceiling at its center. A spectacular curved staircase with railings crafted of forged steel and polished brass leads to a library and upstairs ballrooms that can be used for social or business events. The hotel has three impressive restaurants, two of which are Michelin-starred. The bi-level La Bauhinia has an Eiffel-inspired steel and glass cupola ceiling. It is open daily continuously from 6:30AM to 11PM for meals, snacks or afternoon tea. An eye-catching, three-tier Murano glass chandelier is suspended from the ceiling. Headed up by Chef Philippe Labbe, the 40-sea L’Abeille (the bee in French) has two Michelin stars and uses both traditional and modern cooking techniques to reinvent classic French dishes. During our stay, we were fortunate to dine in the one-Michelin starred Shang Place that serves traditional Cantonese-inspired Chinese dishes. Chef Frank Xu oversees four master chefs specializing in wok, BBQ, chopping and dim sum. A sophisticated but cozy bar, Le Bar, is located near the hotel’s graceful entrance. Although its signature cocktail is the “Pink Lady” (named after New York interior designer Lady Mendl who resided in the building’s private apartments in the 1930s), it also showcases specialty Asian-influenced cocktails. Twenty-four hour room service was available; breakfasts in our room were tasty and elegantly served. In a nod to the hotel’s heritage, Asian-style breakfasts are also available in your room or at La Bauhinia. The hotel has a health club and seductive street-level blue-tiled swimming pool with lounge seating that invites relaxation and rejuvenation in an airy, light-filled setting. The Shangri-La Paris feels like an intimate residence with a house full of servants dedicated to their guests. The hallmark of any stay, even overshadowing the beauty of the property, is probably the friendly, unpretentious but pampered service. If you are planning a once-in-a-lifetime Paris getaway to celebrate a milestone birthday, anniversary or other special occasion, a stay at the Shangri-La Paris is a unique experience that won’t be forgotten. 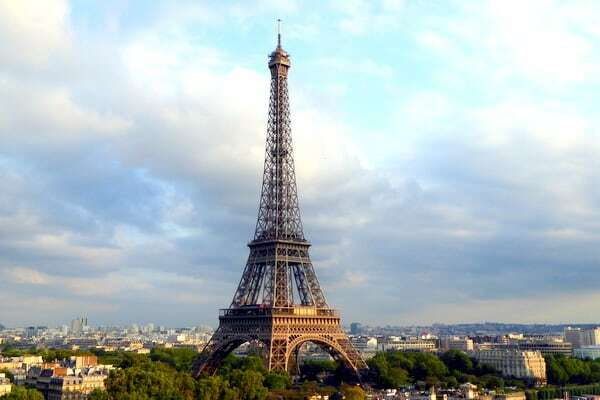 Ask for a room with a magical Eiffel Tower view; some even have small terraces. Check the hotel website for special reduced package rates that may include breakfast. If you can bear to leave your room, be sure to ask the Concierge for a tour of the public areas of the hotel. If you are there on a Wednesday or Sunday, don’t miss the wonderful outdoor public market on Marche Ave du President Wilson, just a stone’s throw from the hotel entrance. Disclosure: We were hosted during our stay at the Shangri-La Paris but any opinions expressed in this post are our own. Having lived in Paris for 25 years, I can pretty much imagine where this hotel is located. The interior sounds divine. How fortunate that this hotel company took on such extravagant renovation. It probably doesn’t matter to most people, but if I stayed in a hotel in Paris, I would want to be near the RER subway, because it gets you places so fast. The subway line that this hotel is nearest to would not be ideal for me. Too slow. But thanks for doing this review. I’m always glad to know what’s going on in Paris. Look at the gilded ballroom! And the pool… And gulp, the prices too :-). But the Shangri-La in Paris does indeed look like a divine place to stay. What a beautiful and special place and how fortunate you were to enjoy it! If – no, when – I return to Paris, I’d love to stay there. Hi Irene, this post of yours is indeed amazing. It is like a true to life experience while I am reading this post. It’s like I’m in Paris right now and having my stay in this prestige Shangri-la Hotel. I was blown and amazed that Eiffel Tower is like that near from the hotel. There’s no need to travel and it is really near. I will save and be there soon.